The subject of the Conference is the exploitation of smart statistics in improving the quality of citizens' life. 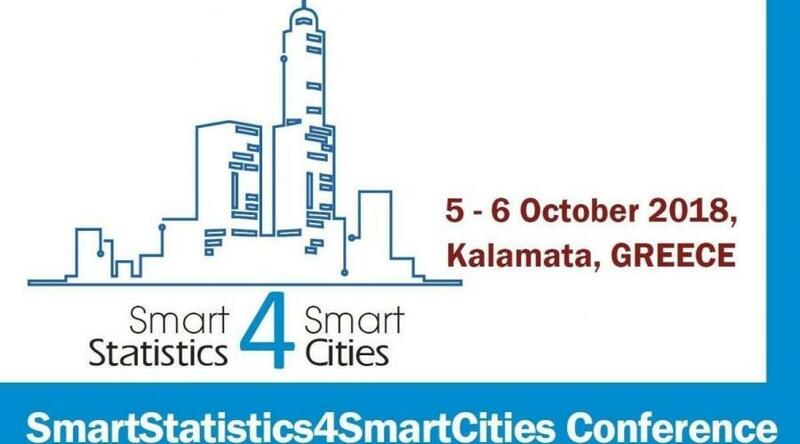 The International Conference SmartStatistics4SmartCities is being organised by the National Documentation Centre (EKT), Eurostat, the Hellenic Statistical Authority, the City of Kalamata and the 2nd Lyceum of Kalamata. The subject of the conference is the exploitation of smart statistics, data from portable and consumer electronic devices, to improve the quality of life and the daily life of citizens. The key objective of the Conference is to raise awareness of the importance of building sustainable partnerships between official statistics, municipalities, . academic institutions, citizens and businesses. This can maximise the potential of data analytics for informed policy decisions on cities for the well-being of the citizens living in, working in and/or visiting them, and for the operations of businesses with activities in and with them. Smart Statistics can be seen as the future extended role of Official Statistics in a world impregnated with smart technologies. Smart technologies involve real-time, automated, interactive technologies that optimize the physical operation of appliances and consumer devices. Statistics themselves would then be transformed into a smart technology embedded in smart systems that would transform ‘data’ to ‘information’. Developments in Smart Cities and Official Statistics follow independent parallel paths despite their common basic ingredient which is ‘data’, let it be open data, big data, smart data, linked data, but, in essence, it is data. Challenges in using Artificial Intelligence, big data and open algorithms for human development. Speakers from a number of countries will participate in the Conference, and will represent city administration, research & academic institutes, the private sector and statistical services. Taking part in the Conference will be senior executives of the conference organisers, internationally renowned researchers, the general public and high school students, which will ensure the wide and multiple diffusion of event outcomes. In addition, there will be examples of cities which have already integrated smart statistics into their operations for the benefit of their citizens. The Conference will be held at the Filoxenia Hotel in Kalamata and admission is free (however, online registration is required). The Conference programme is available at the site of the event. As an organisation and authority of the Hellenic Statistical Authority , the National Documentation centre (EKT) aims to develop, produce and disseminate quality statistics for Research, Technology, Development and Innovation (RTDI). Its main activity in this area is the production of national statistics for RTDI. produce reliable indicators for the whole cycle of Greek research, from funding and research factors, bodies and researchers, to the production of research results, scientific publications, monographs, PhD theses etc. use the combined processing of data to produce indicators for the comparative positioning of Greece in the international environment and support the formulation and systematic monitoring of policies at national, regional and thematic levels. www.ekt.gr, with information from EKT, Eurostat, EL.STAT.